What it is like to get lost knee deep in a labyrinth of food and sound with Hot Since 82 and his friends. Rubbing elbows with some of your favourite DJs and producers is not that uncommon here on Ibiza, but seldom does it seem that the opportunity actually comes around. Even less common is being able to enjoy a dinner with said DJs before their show, but that was just the chance a handful of us writers were given when Daley Padley, better known as Hot Since 82, and the team over at Pacha invited us to dinner before their Labyrinth residency Friday night. Hot Since 82's Labyrinth residency has been a long time coming. The northern Britton's career has deep roots on the White Isle, so it was only a matter of time before he had his own complete, end-to-end residency. 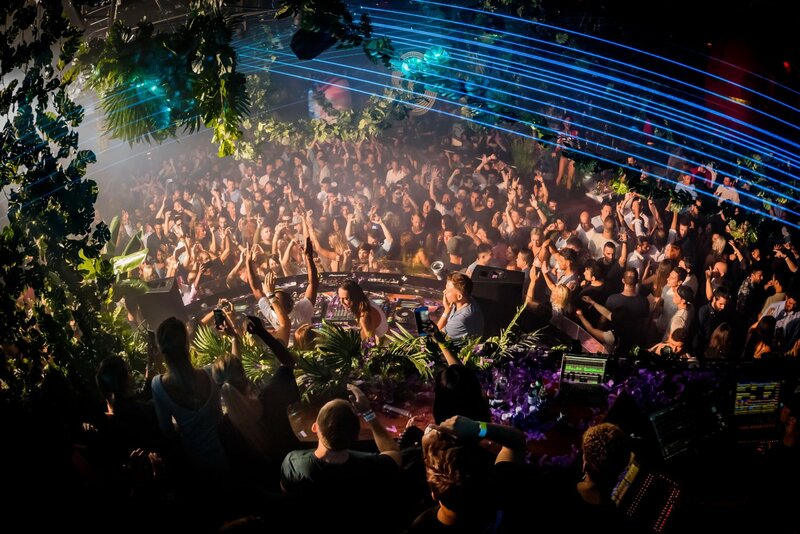 Last season, clubbers were given a taste of what was to come when the Brit brought his Knee Deep concept over to Pacha for a special three dates. This time around, Padley had a full 20 dates at his disposal, and he made sure to bring some of his best friends with him. For this special night, he called upon legends DJ Harvey and Erick Morillo, as well as Swedish DJ La Fleur to take the decks with him. The night began on an intimate note at the Pacha Restaurant, where we are all given an assortment of some of the restaurant's best delicacies along with some wine. The restaurant has a huge Japanese influence so this, of course, meant sushi, sashimi, various rolls and other seafood. You can tell how much Padley is respected by everyone in the industry and even the island in particular just by the way he cares and gives back. From the outside, it would seem that a dining experience like this would see the hierarchy take over, but this occasion was held together with a level of humbleness that was unable to be ignored. Once dinner came to a close, clubbing was immediately in order as everyone made their way over into Pacha's legendary walls. DJ Harvey was already on the decks at this point and bumping Eric Volta's Love Your Illusion much to the clubbers' delight. There is much to be said about the production of Labyrinth as it turned the club into an exotic jungle. Vines crept down from the ceiling and into the crowd as fog pervaded through the air. A giant Moai statue stood to watch in the back of the club, stone-faced as if it had another choice. The atmosphere was dark and smoky, yet there was this sense of mysticism in the ambience. This, at the end of the day, is Labyrinth's purpose: to get you lost in a maze of music and forget everything else for the night. Once Hot Since 82 took the decks, the crowd bought into this idea and let loose without inhibition. While everyone, including myself, may have been lost in the tunes, we knew that we were right where we were supposed to be. Just like the Mark Fanciulli & Rob track that the Brit dropped in the night, we were a Slave To The Rave. Erick Morillo played after the head honcho, and put on an absolute house clinic with track's like Lo Coco's Life Is Hard. It is hard not get into the vibe once Morillo starts playing as he properly gets into it himself. If the night resembled the maze, then the DJs were our guides and Morillo accordingly showed us the way. Even more special was when Hot Since 82 went back on the decks with the American to go back-to-back for the last leg of the journey, dropping gems like Âme's Rej along the way. As the season comes to an end soon, only a few opportunities remain to get lost in the Labyrinth with Hot Since 82 and his pals. More specifically only three more shows are left with the closing approaching quickly on Friday 6 October. This coming Friday the Brit is bringing techno's favourite couple Adam Beyer and Ida Engberg who will be going b2b as well as La Fleur and Alex Kennon. You definitely won't want to miss this one so get your tickets while you can.